Tuesday, June 26, 2018 Grand Haven — MDNR Wildlife Biologist Nik Kalejs and Grand Haven Board of Light and Power employee’s Matt McKee and Bob Scamehorn made the 240 foot climb up the chimney at the J.B. Sims Generating Facility for the banding of this year’s Peregrine Falcon brood. The BLP nest site has produced 16 broods for a total of 45 chicks since the first pair of wild Peregrine Falcons began nesting on the Grand Haven power plant’s chimney in 2001. Wildlife Biologist Kalejs reported there are three healthy chicks, called eyas, in the nest box. “Since 2001, we have been able to band every one of the chicks produced at J.B. Sims. The 45 chicks produced at the Sims Plant make it one of the most productive peregrine nesting and banding sites in the entire state, let alone West Michigan. This year, the cold early spring weather delayed nesting success, but the falcons surprised us all and came through again with three healthy looking chicks. We also appreciate the help and cooperation of the Board of Light and Power in continuing to support the management of this rare species”. With this year’s brood, the Grand Haven nest site has produced 25 female and 20 male chicks. Peregrine Falcons were listed as an endangered species by the U.S. Fish and Wildlife Service in 1970, after their Midwest population was eliminated in the mid-1960s due to problems with the pesticide DDT. 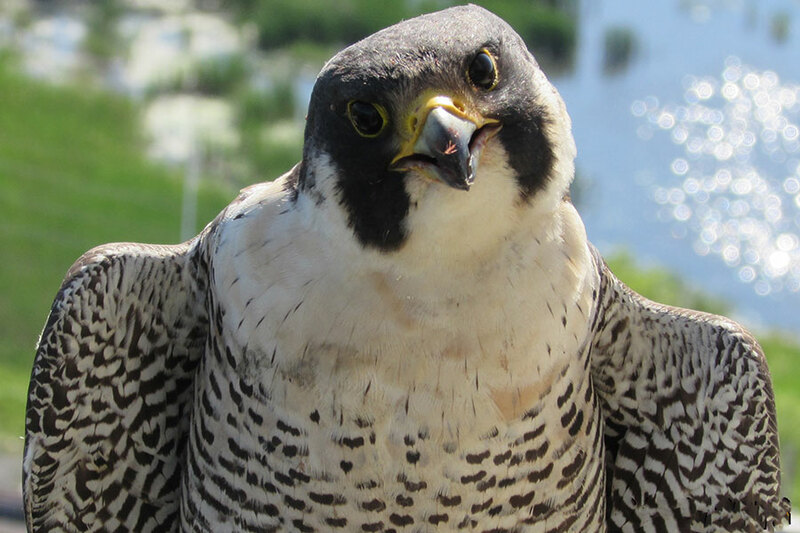 In 1999, following extensive restoration efforts, the Peregrine Falcon was removed from the federally endangered species list, but it remains on the Michigan endangered species list. “Restoration efforts have come a long way in West Michigan since 2001. This year, we had successful peregrine nests in Kalamazoo, Grand Rapids (two nests), the J.H. Campbell Plant by Pigeon Lake, and of course, Grand Haven. We are hoping that eventually the peregrine falcon population will be completely re-established so that everyone can enjoy seeing these incredible birds,” Kalejs commented. Kalejs evaluated the nest box for any structural issues and determined one of the top boards should be replaced along with some minor repairs to the sideboards. These items will be addressed after the birds have fledged this coming fall. Grand Haven area birdwatchers may view the Peregrine Falcons from Linear Park on Harbor Island in Grand Haven. The eyas will begin to learn to fly, or “fledge,” in three to four weeks and are expected to remain in the area until fall before migrating south for the winter. Adult Peregrines will mate for life, and generally use the same nesting site each year.